Single in Kidderminster, Worcestershire or in any of the neighbouring counties of even in Birmingham? Then Gemma’s dating profile will interest you. 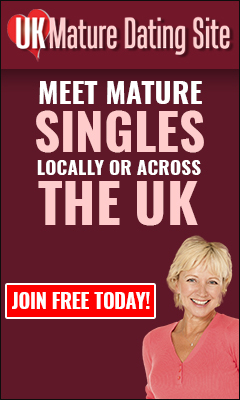 And of course, you have to be over 40, given that UK Mature Dating Site is exclusively for single men and women over the age of forty. Now that we have established that you have to be an older single male for Gemma to consider going out with you. Here is a bit more information about here. First read her dating profile characteristics to get a flavour of the kind of person she is. Then read more info about here at the bottom of this post. Sports including swim, run, cycle and going to the Cinema. I’ve got a good appetite and open to new foods. I don’t have a favourite. If you get to know me, you can find out. I’m looking for a long term relationship \u0026 no mind games. Not interested in one night stands or friends with benefits, I want a man who isn’t scared to commit \u0026 show his feelings! I have 2 adult daughters \u0026 3 granddaughters. Read cinema theatre eat out. Another difficult one..I’m honest, happy, caring..but also strong minded, pedantic, and dismissive…Well I am a woman after all!! If you are a man, you live in or near Spondon in Derby, you may find this dating profile interesting. It is the dating profile of a 41-year-old mature single, with two grown up children. She is a professional, who is established in her profession. She is looking to meet a man, around her own age for romance that will hopefully blossom to a long term relationship. I have been said to be a spontaneous person. I am warm and enjoyable to be around (so I’m told) I love the company of close friends and enjoy casual dinners, however my space is important to me. I am a homemaker and love creating a warm safe environment. I am looking forward to starting my third life with optimism experience, little baggage. I’m looking at the next 35-40 years of growing with someone, so much still to do. It really depends on the company. I love exploring antique shops, going to museum and other funs things. I love anything Italia, wash down with dry white wine. I have been told by many people that I am fun to be around. The major cities of Europe. Well, I have to play it first. I don’t play the lottery. Getting into a cage with sharks around me in the sea.